Do you have a guilty pleasure snack? 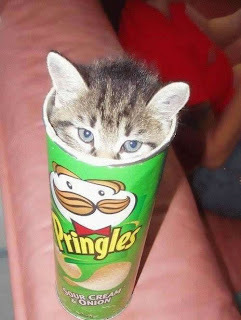 I'm an avowed chocoholic but my true snack lust is reserved for Pringles. I love the crispy potato stacks and their tall proprietary cans with the seldom-needed plastic lids… as they've said "once you pop you can't stop." This is particularly true of flavors like pizza, sour cream and, uh, tabby kitten. 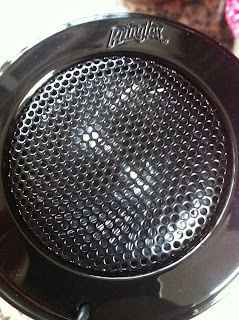 I have to say the sound quality is not bad and this is definitely the loudest MP3 plug-in speaker device that I've tried. It runs on 3 AAA batteries and also works on a full can, but the bass sounds better with the empty can. I wasn't really expecting it to be so nifty. Bob actually snatched it to use while working on his garden trellises today. Roo ate all of the Pringles! Great excuse to do some snacking this summer! In accordance to the FTC Guidelines and WOMMA Code of Ethics, I am disclosing that I received the items shown above to facilitate this review. All opinions are, as usual, strictly my own. That's so cool! 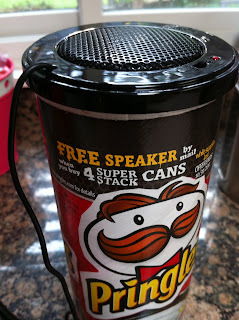 You can also use pringles cans to make a "cantenna" to boost your internet.